The fourth Thursday of the month is the day many of us, retirees, assemble at the Pi office to recount some of the Mac related special happenings during the past days. Some sessions are just okay, but this month’s session was beyond just okay. Don Fortnum, our designated speaker, had all of us totally attentive with his very well organized presentation on home movies and photos. Don came with boxes of his photo handiwork. But he didn’t bring just a batch of miscellaneous videos. No, that is not how Don works. He has dozens of home DVD’s, each contained in its own hard plastic container, and each with clearly readable identification. We appreciated his careful attention to detail as he proceeded with his demonstration. 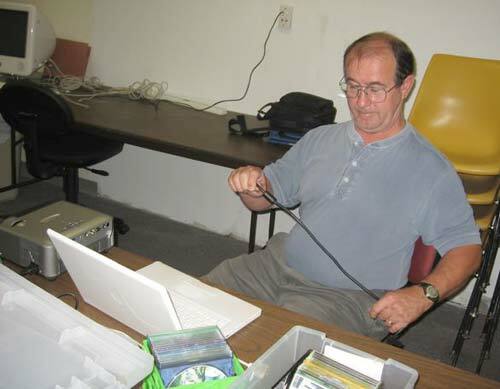 Bob Jarecke attempts to cable together various pieces of equipment brought in by different members to the September Retired SIG meeting. Don briefly discussed the use of Epson’s line of inkjet printers that allow you to print full-color illustrations directly onto CDs and DVDs. He showed how video clips from a Canon PowerShot SD550 still camera could be imported into iPhoto and then used in iMovie; a short sample movie is posted on the Retired SIG Web site (http://www.wap.org/retired/retired200709/). He also briefly discussed the use of iPhoto to make books and the use of Pages to make illustrated letters to send to relatives via "snail mail." 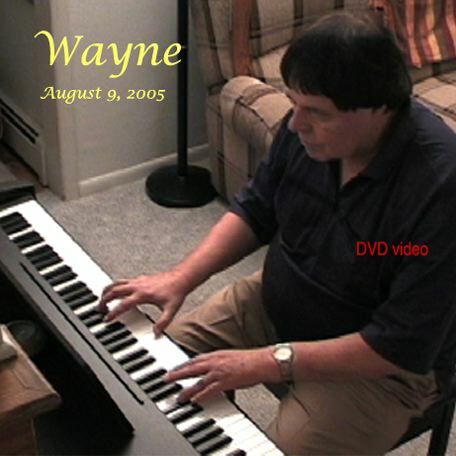 Particularly outstanding was the DVD movie he made of a close friend who is an exceptional piano player. To make the movie, Don positioned his camera high above the piano so that the camera was able to capture the piano keyboard, the player’s finger movements, the piano’s sound and enough of the player to complete a most delightful scene. Custom photo DVD case cover produced by Dan Fortnum. His craftsmanship didn’t end there. The piano player moved gracefully through about fifteen songs. Don made a list of the titles of those songs and arranged the titles to match each song-very professional. That disk, together with the photo of the player and the list of songs were all placed in a hard plastic container, like those of commercial DVDs you find in a store. Don finished of with a presentation of how to make a photo book. This was something I’d thought about doing, but hesitated. I will hesitate no more.